No TRICKS this year -- just TREATS! Catie Simpson knew early on that her infant son Oscar had allergies. At first, a simple bottle of formula would cause her son to break out in hives. And as he grew, so did his allergies. Milk, eggs, peanuts, and cashews would cause swelling or eczema, and Catie was tired of worrying. 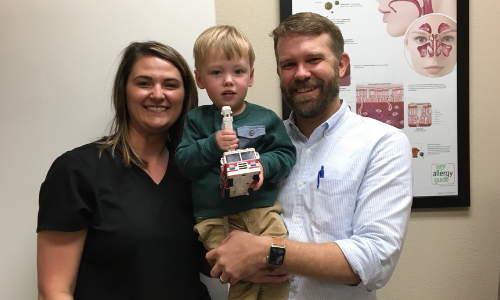 Months after Oscar’s first birthday, he began OIT treatment with Dr. Stacy Silvers. Today, he is the youngest child to graduate from the Texan Allergy OIT program at 2 years old. Although Oscar might need additional OIT for other allergies, for now, he’s cleared a big hurdle by completing immunotherapy for peanuts, one of the most common food allergies.This year, trick or treating won’t be quite as frightful.